Cary Ratcliff (b. 1953) studied at Eastman School of Music. His operas include Eleni, which was selected for New York City Opera’s 2008 VOX concert showcase, and Mice and Beans for children’s chorus. Chamber works include Gitanjali Dances for flute and piano and Grasshopper Dances for saxophone and strings. His Viola Concerto won the ASCAP Nissim Prize for best new American orchestral work. He also created orchestral soundtracks for the Smithsonian’s Air and Space Museum. Recordings include Kathryn Lewek sings Cary Ratcliff, an album of art songs, and Mitzie Collins’s Rejoice, virtuosic carols for flute, harp and hammered dulcimer. His choral works are published by G. Schirmer, Boosey & Hawkes, and Hal Leonard. Shawn Kirchner (b. 1970) is a composer, arranger, singer, and pianist. He sings with the Los Angeles Master Chorale and in 2012 was appointed its composer-in-residence. His projects for LAMC include Songs of Ascent, psalms for chorus & strings (2015); Inscapes, a cappella settings of the poetry of Gerard Manley Hopkins (2014); and Plath Songs, settings of Sylvia Plath’s poetry for chorus, piano, and percussion (2013). Kirchner’s TV/film credits include music director/arranger for the 2004 CBS Christmas Eve special and singer on two dozen feature film soundtracks. Kirchner earned an MA in choral conducting from the University of Iowa. His music is published by Santa Barbara, Oxford, Boosey & Hawkes, and Shawn Kirchner Publishing. Donald Grantham (b. 1947) has received numerous composition awards and prizes, including the Prix Lili Boulanger, Nissim/ASCAP Orchestral Composition Prize, and first prize in the National Opera Association’s Composition Competition. His music has been praised for its “elegance, sensitivity, lucidity of thought, clarity of expression and fine lyricism” by the American Academy and Institute of Arts and Letters. 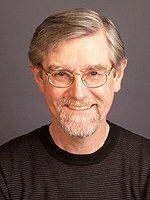 Grantham’s works have been performed by the Cleveland, Dallas, and Atlanta orchestras and the American Composers Orchestra among many others, and he has fulfilled commissions in media ranging from solo instruments to opera. 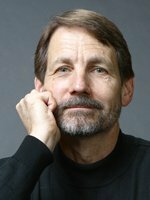 His music is published by Piquant Press, Peer-Southern and E. C. Schirmer Music Co. Grantham is Professor of Composition at The University of Texas at Austin. 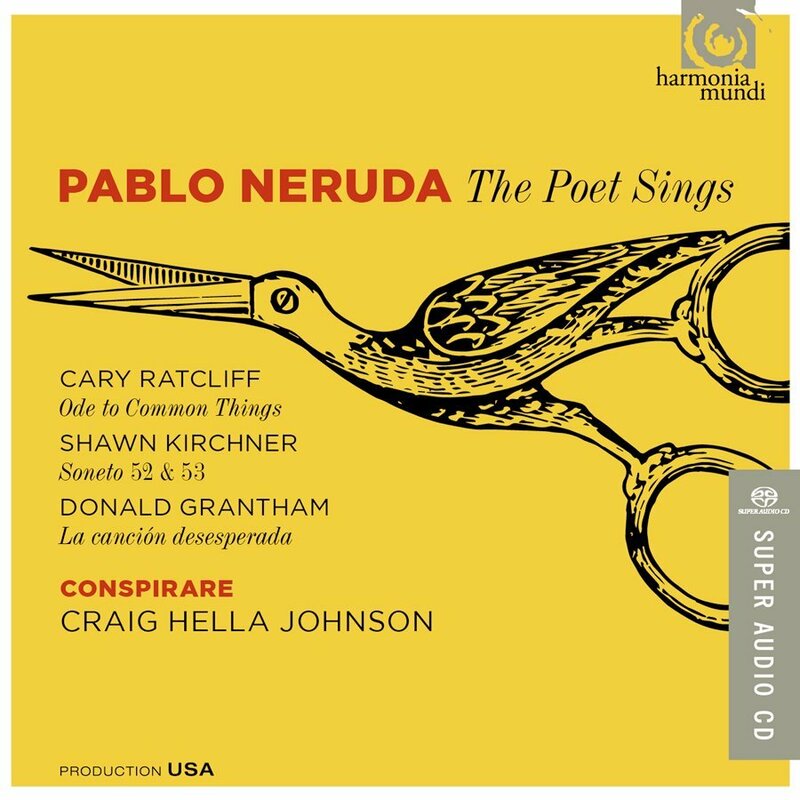 Craig Hella Johnson leads Conspirare in this vibrant tribute to revered Chilean poet and statesman Pablo Neruda (1904-1973), whose life-affirming poetry is the inspiration for these captivating choral settings by Donald Grantham, Shawn Kirchner and Cary Ratcliff, all recorded here for the first time. (from Harmonia Mundi package notes). 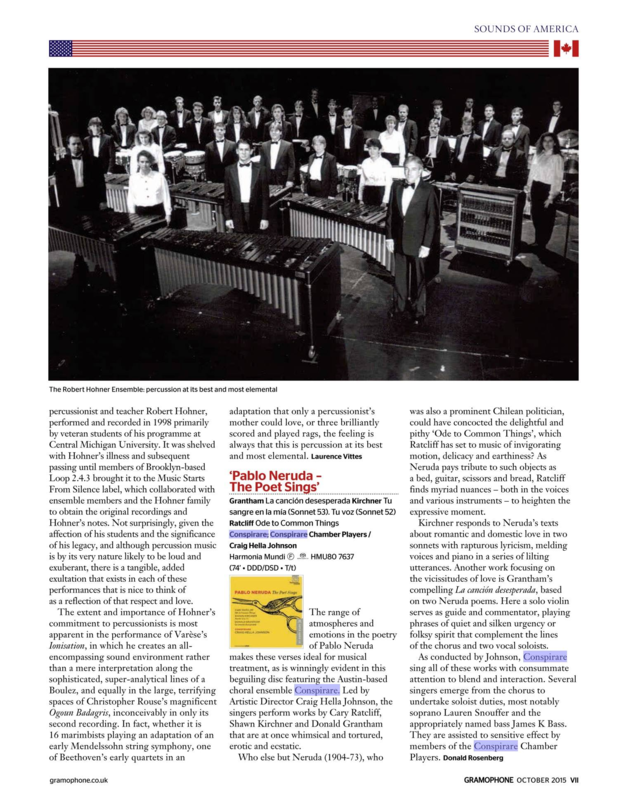 Texts and notes on the works are found in the September 2014 program booklet. With soloists Lauren Snouffer (soprano), Laura Mercado-Wright (mezzo-soprano), Eric Neuville (tenor), James K. Bass (bass), Stephen Redfield (violin), Faith DeBow (piano), Michelle Schumann (piano), Michael Gratovich (guitar) and Conspirare Chamber Players.